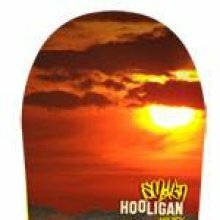 The Smokin Hooligan has a flat to rocker combined with Magnetraction which is not something we normally see in a snowboard. This is a good Jib board with an all mountain freestyle to freestyle aftertaste. It’s a really fun jib board that feels stable and pretty poppy for a flat to rocker park ride. Smokin follows the philosopy that Mervin does where they try to make boards that might specialize in one thing but still do well everywhere else. Even though this is more of a jib specialist it’s still fun elswere in the park and even on the mountain. 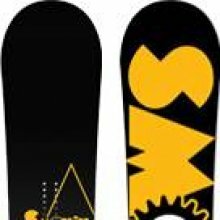 It’s quick and snappy, fun edge to edge and a ride that does more than just jib well. On Snow Feel – It’s a fun and stable for a small park/jib board. If you are going to hit up the mountain the Jib board will surprise you with how it can ride big for it’s size and you can take it outside the park. It’s very stable between the feet flat basing and one footing. Powder: This board runs short but the flat to rocker makes the ride a bit easier than it would be if it’s camber. Turn Initiation and Carving– It feels easy edge to edge but feels more on the moderate side of easy.It felt a little sluggish for slower turns but was kind of snappy if you put some fast twitch muscle strength into a turn. For being so short you would think it would feel easier edge to edge for short radius turning. For wide radius turns to carving it’s not ideal but better than you would think. Speed: It’s not going to blow minds in the mountain riding world but it’s pretty fast for a park board. Uneven Terrain: It’ felt thick and strong but it wasn’t at home dealing with bumpy harder snow and it just felt a little too unforgiving. Approximate Weight– It’s not a light board even though it’s small. 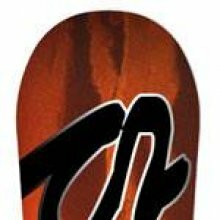 Edge Hold: Some serious grip going on with the flat between the feet and magnetraction in the side cut. Even if you file down the edges the edge hold will still be good. A lot of jibbers don’t care about edge hold but for those that do you might like this board. Flex: This is a soft but probably closer to the medium side of the flex spectrum. It’s one of those boards that is easy to butter but not a pushover either. It feels pretty stiff torsionally. Switch: It’s a twin so it’s super easy. Jibbing- It’s one of those boards that has decent snap to get onto a jib or technical rail and it out performs many jib boards out there. It wasn’t my personal favorite but I could see how some one could enjoy this type of ride. Pipe: It’s not a great pipe board but if you don’t dull the edges it holds well. Jumps: There isn’t an effortless spring but with a little effort It will pop pretty well. It’s very stable on a slight edge taking off of a jump and is pretty forgiving when landing too. All in all this is a solid jib board that is more than a jib board that we think many will really enjoy. We try to get as many images of the Smokin Hooligan, but forgive us if they're not all there.